These red wines result from a “coupage” of different grape varieties, in which we have maintained the traceability of each vineyard’s production during the winemaking and during the barrel aging. This helps us to decide at the time of bottling the characteristics that we want you to have in each wine. As any classic Rioja wine, it is very important to oxygenate all of them before they are consumed, so the wine can offer its full potential. We recommend to open each bottle at least 30 minutes before consumption (in the case of Gran Reserva, even several hours), and / or the use of a decanter improving oxygenation. The Akutain Cosecha wines are premium class young red wines, without aging in barrels, although with the winter stay in tanks where the wine is stabilized and acquires its clarity by decanting (like all wines in Bodega Akutain, they are natural wines without any filtering process). They are very fresh and fruity wines made from the grapes that we obtain from our vineyards of lower altitude, easy to drink and pair. They are ideal to be tasted at the time when we place them in the market and during the next 2 or 3 years. Young wine with no barrel aging. The Bodega Akutain Crianza wines are red wines with a middle aging in oak barrels (at least 14 months) and bottles (at least 8 months). Bottle aging is very important for the type of wines we make, since they require some stabilization after bottling before beginning their evolution in the bottle. We take care of this evolution during the first months in ideal and very special conditions while the bottles rest in our cellars excavated under the vines. They are wines made to be tasted at the time of their marketing, still with plenty of freshness and a nice touch of fruit, although they also have an interesting guarding potential ahead (5-10 years in optimal conditions). Wine aged in oak barrels for 14 to 16 months. 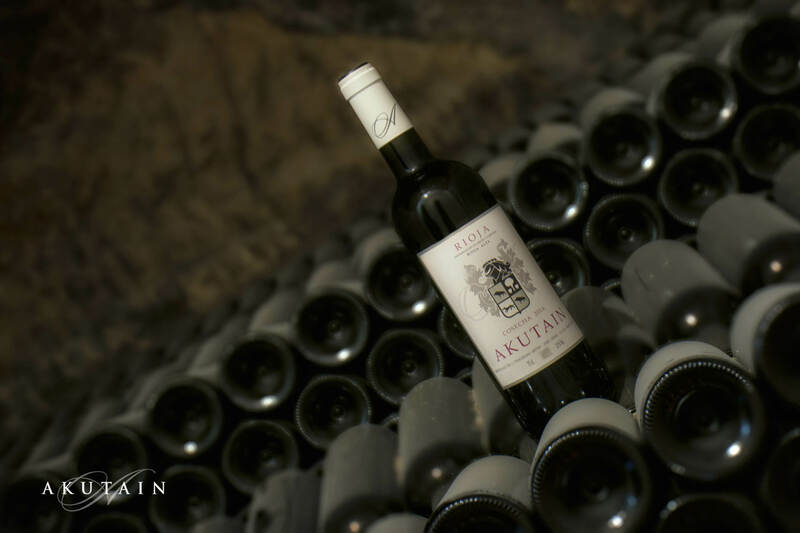 Our Akutain Reserva wines are red wines with medium / long aging in oak barrels (at least 17 months) and bottles (at least 12 months). The relevance of bottle aging increases in the case of our Reservas comparing to our Crianzas. For a good stabilization and for an ideal evolution in their first months in the bottle, they rest as always in our traditional cellars in a protected environment and with ideal characteristics until they reach their optimal marketing time. These are wines that present a certain complexity, although with a great balance of acidity and fruit, being this fruitiness more remarkable than in our Gran Reservas. We market our Reservas at an optimal time of consumption with a few years of aging potential ahead: 10-15 years in optimal conditions. Wine aged in oak barrels for 17 to 27 months. Akutain Gran Reserva is a red wine that we only make in exceptional vintages (approximately 2 or 3 vintages per decade) where the grapes have the unique quality and special characteristics that make possible and nearly demand a long aging in oak barrels (at least 28 months) and in bottle (at least 30 months in our cellars before being marketed). The importance of bottle aging becomes crucial in our Gran Reservas after a long barrel aging. For these wines with such a long aging, we usually use the grapes obtained from our vineyard of higher altitude Gembres (650m). Wine aged in oak barrels for 28 to 40 months. They are long and complex wines that present a great quantity of nuances, optimal to be tasted and enjoyed at the moment in which we market them, but with a great potential of aging (15-20 years or more in optimal conditions).